Fig. 9.3 Demonstration of abiotic CO2 production compromising value of "soil respiration" as a measure of subzero biological activity. Main panel: Long-term dynamics of CO2 release from the soil column during its flushing with N2 and dry heating (first arrow) followed by treatment with overheated steam (second arrow). The soil is from the upper soil layer of the NJ forest soil. After 1,000 h (42 days), the cumulative amount of released CO2 was 20.11 mg C g-1 soil or 38% of the total soil C. Insert: CO2 evolution from the same soil at 25°C after autoclaving (30 min, 121°C) as compared with the untreated control. Note that autoclaving increases CO2 release. Continuous curves were fitted to double exponential regression equation displayed on the graph that the first pool is formed by free or loosely bound CO2 (probably surface binding to soil particles and gas dissolved in soil water) which stays in equilibrium with the gas partial pressure in soil air (Henry law); therefore, it is easily removed by soil flushing. The second larger pool is represented by tightly bound CO2 molecules. 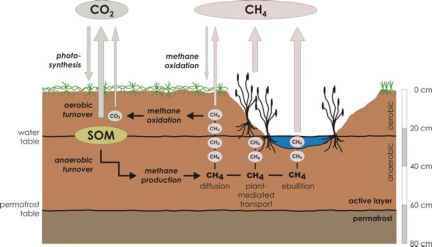 It should be a non-covalent interaction between CO2 and soil phase and probably involves gas molecules entrapment within a soil inter-aggregate space, such as half-closed microscopic cavities formed by organo-mineral complexes. Heating and especially steam-flushing (as during autoclaving) eventually remove firmly bound CO2, probably via competitive replacement of physically or H-bounded CO2 with water molecules. To release 95% of the total CO2 we had to spent 43 days (!) 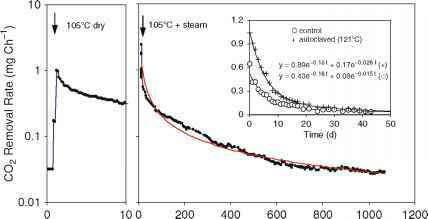 of continuous soil flushing with overheated steam at 105-110°C (Fig. 9.3). It is remarkable that the size of this pool is equivalent to ca. 40% of the total soil C measured by soil ignition! It was proven that released CO2 was not a pyrolysis artifact because heating to the same temperature without gas flow produced a negligible amount of CO2. The main conclusion derived from this methodology work is that cold-season in situ CO2 emissions or laboratory-measured CO2 evolution from frozen soils have two components: the bigger one is abiotic release of accumulated CO2, and the smaller one could be instant respiratory activity of psychrophilic soil biota. The total flux of unlabeled CO2 from frozen soils should significantly overestimate an actual respiration of microbial community. Overestimation of methane and N2O generation is probably smaller due to higher mobility of these gases, but it should be tested in future. Oxygen uptake is impractical because of low precision (too high ambient content of O2 in atmosphere) and possible abiotic oxidation reactions.